Very useful listening. Eight excerpts of Obama´s victory speech with blanks to fill in. WITH KEY. 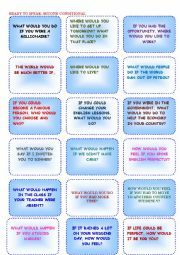 I really think it can be very useful and interesting for your students.Enjoy it! 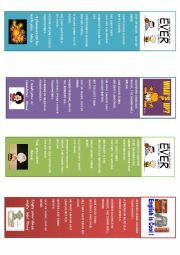 I made these bookmarks for those pupils or adult learnes that deserve a nice treatment. They are editable. Change them the way you like! Have a nice day! 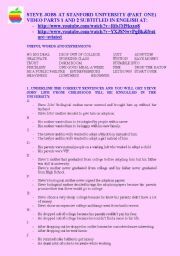 This is a worksheet where one of the typical TV commercials in shopping channels is analysed. SS learn new words and after that they give their opinion about this kind of ads. The commercial is really funny and my pupils had a really nice time with the activity. We laughed a lot.Hope you like it! THESE CARDS ARE USEFUL TO PRACTISE THE SECOND CONDITIONAL AS AN ORAL ACTIVITY. MAKE SOME COPIES. DIVIDE THE CLASS IN GROUPS AND GIVE EACH GROUP A SET OF CARDS. HAVE FUN! 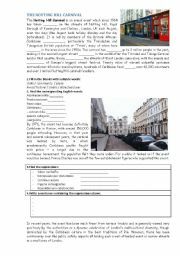 In these two worksheets your students will find general information about Notting Hill Carnival. The texts are not my originals. 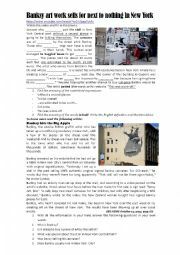 I have picked them from the web and I have made up some activities so that students can know some words related to this particular celebration.There is also a final task: a composition. It includes a useful KEY. 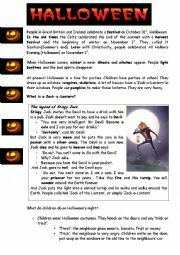 Easy explanations about Halloween and the origin of the name Jack-o-Lantern, Jack of the Lantern in fact. Have a nice and scary Halloween!!!! 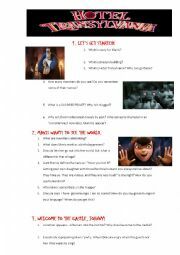 Two very complete sheets based on Hotel Transylvania, a very funny movie. Lots of questions. The movie is divided in several parts. And you have a very complete KEY with all the answers. A pleasure to share it with all of you. HAPPY HALLOWEEN! Two in one. A video about last but not least idea of Banksy, the graffiti artist. Students have to fill in the gaps while watcihg the video on youtube(website provided). 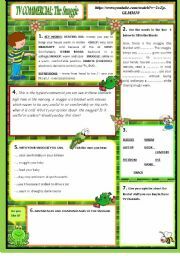 Also there are vocabulary exercises plus a CBS article about the same topic and a reading comprehension.Enjoy it! This is a listening on child labour.I used the link provided by baloochester and I added a lot of exercises to have enough stuff for a class. You´ve got the LINK and the KEY as well.HAVE A NICE WEEK!